Employers firing an employee for gross misconduct can hand them a letter such as this during their final meeting. The committee reviewing your disciplinary hearing has convened, and they have determined that your behavior on July 8, 2018 constituted gross misconduct by violating company policies 31(a), 540(d), and 238. As such, you are hereby terminated from your position at ABC Company, effective immediately. Should you choose to appeal this decision, you may contact Karen White in HR at 555-555-5555. She can also answer any questions you have regarding your final check and overtime. 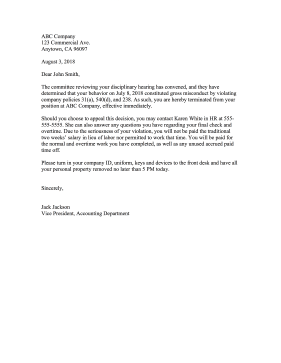 Due to the seriousness of your violation, you will not be paid the traditional two weeks� salary in lieu of labor nor permitted to work that time. You will be paid for the normal and overtime work you have completed, as well as any unused accrued paid time off. Please turn in your company ID, uniform, keys and devices to the front desk and have all your personal property removed no later than 5 PM today.